A mini storage space might be the perfect solution for you. Time after time our Houston customers tell us they wish they had learned about the ease and convenience of mini storage. a long time a go. Getting a storage room for your extra belongings, whether from the home or the office, is a smart solution. Our mini storage rooms range in size from 5 x 5 to 10 x 20 and are perfect for all of your storage needs. Call today to reserve your mini storage space. Our friendly staff is waiting to hear from you. 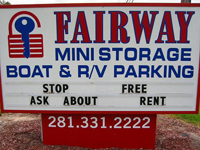 Call Fairway Storage at: (281) 331-2222 to reserve your mini storage rental. You may also reserve your mini storage space online. Thank you for choosing Fairway Storage for all of your storage needs.